With 3 kids, all 3 and under, I live in a land of princesses and pirates. 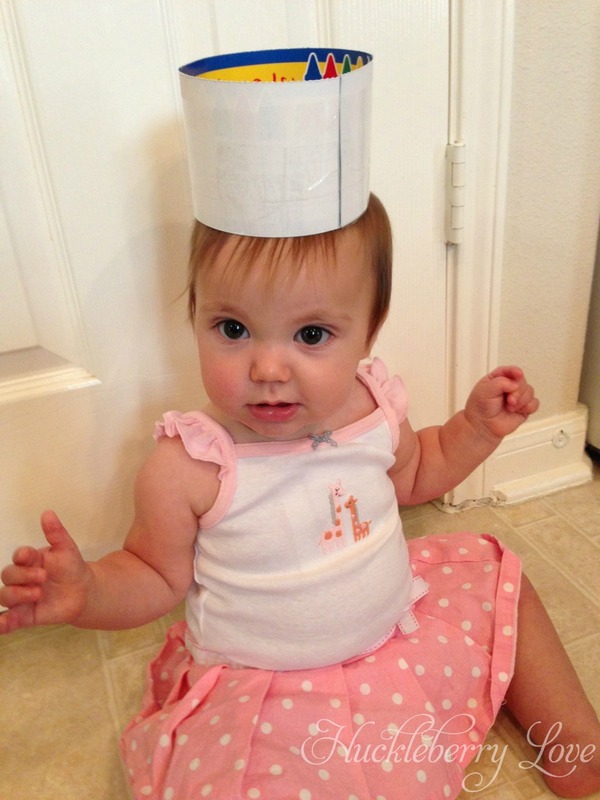 We love to play dress up at our house. So much so, that there's a whole toy bin dedicated to hats, and another to costumes. Mr. H is obsessed with being a builder. He dresses up in his little button down shirt and hard hat, telling me 're-re builder man'. Miss E is so much into princesses. If it's pink and has a matching crown, she'll like it. A while back, when I was pregnant with my littlest, I came across these super cute newborn photos of baby girls in little princess crowns. I knew that I had to make some for my daughter's newborn photo session, so I looked at a few tutorials on pinterest and came up with my own method. 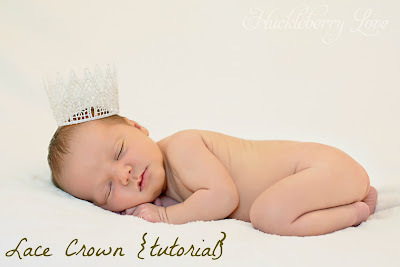 Here's a newborn photo of my littlest one wearing a crown (taken by Kiss the Moon Photography). Now this project was super easy, but took a little bit of wait time. Give yourself a day to finish these babies, you don't want your princess wearing a soggy crown ;-) I've done the microwave method, but have not been as happy with the results. Maybe it has something to do with the type of fabric stiffener I have on hand, not sure. They work both ways, so if you're in a time crunch, just go for the microwave! Lace: I get mine by the spool. Hobby lobby has great variety to choose from, Joann's, not so much. Paint: I used acrylic paint in a metallic silver. Place lace in bowl, cover in fabric stiffener. 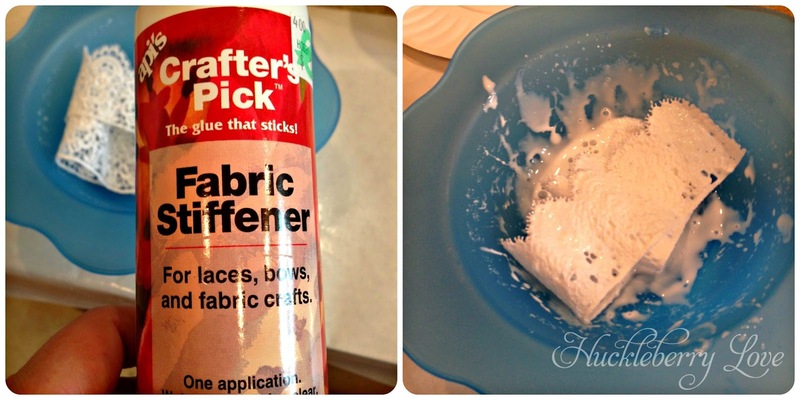 My fabric stiffener looked more like a glue, so this worked really well. 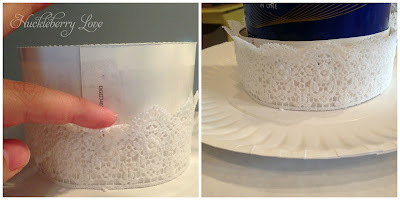 You can also lay the lace flat on wax paper and do several coats. When the fabric is nice and covered, lay flat to dry for a bit. 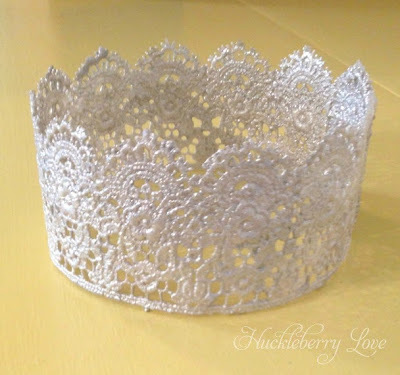 While your lace dries, go ahead and make the crown form. I used poster board, but a stiff card stock will do the trick. Cut your card stock to the length of the lace. Overlap ends to form a circular loop. Tape together using your packing tape, going around the whole loop, making a non-stick surface. When the lace isn't sopping wet and can stand a little on it's own, place it on the crown form. Overlap the ends and press in place. You may want to use a dab of tacky glue. Mine stayed in place pretty well without. 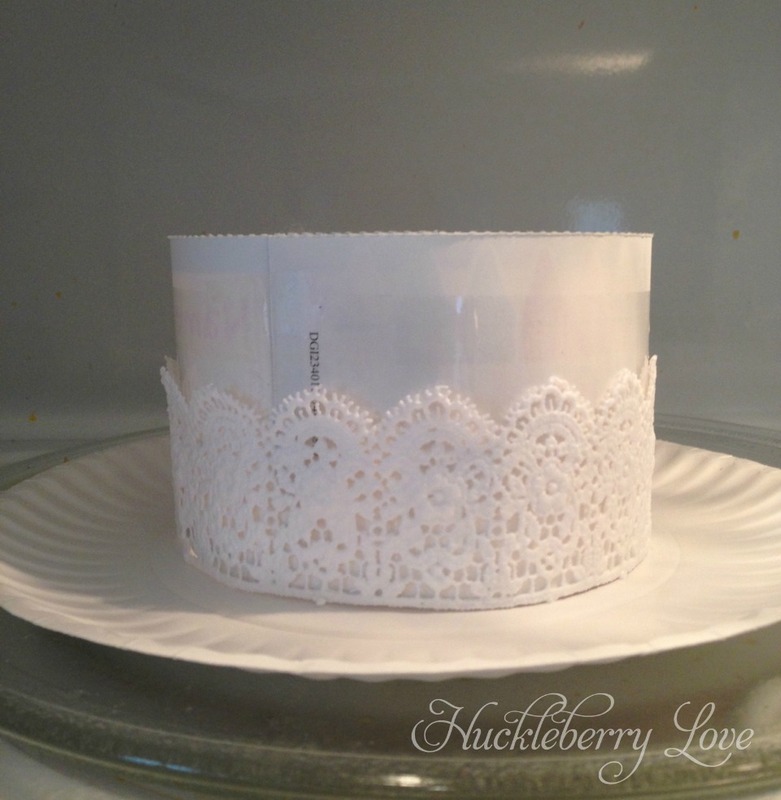 Allow to dry overnight or if you're in a pinch, you can microwave at this step. I did a couple 30 second intervals and checked the stiffness each time. While it was still pliable, I decided to flare out the peaks of one of the crowns. I just bent each peak down and held it there for a few seconds. Now you should have a pretty stiff crown that needs some paint! I went with a pretty metallic silver. Everything can't be pink, right? Paint on a few coats and let dry. You could be finished with the crown, but I decided to go the extra mile and add some glitter. Just one coat made this crown super sparkly. Oh and here's a some from the first go around! Didn't they turn out so cute? One of these was sent to Ohio for a family friend's granddaughter's one year photo shoot. Boy that's a mouthful ;-) I may have to make some more for my littlest princess closer to her birthday. 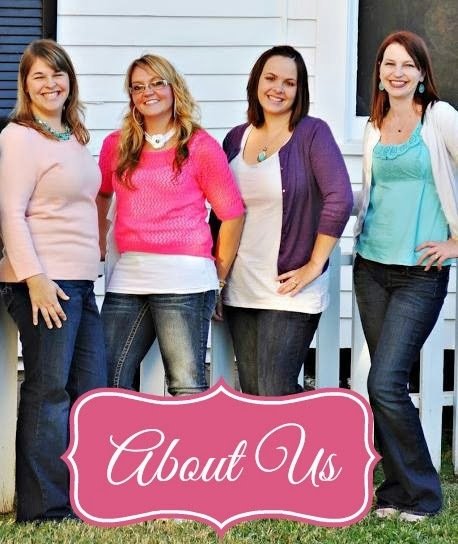 Found you ladies on the Crafty Blog Stalker and am loving this simple little project! My little girl would love one of these! 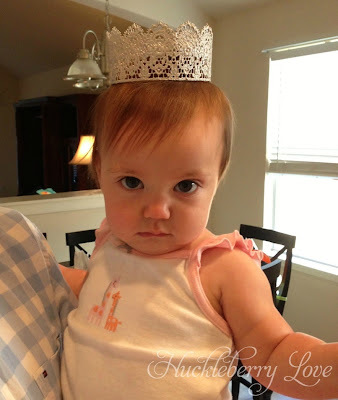 I'm your newest Bloglovin' follower and will be back next week for your link party! Thanks! This is adorable! My daughter would love this! My first granddaughter is now 2 months old. 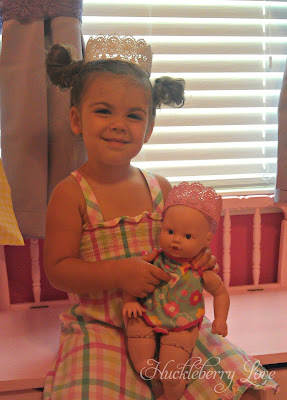 I CAN"T wait to make a lace crown for her and have a photo shoot! Thanks for such a fun creative idea! We would love it if you would join our Saturday Show Us How You Rock Link Party with this post or any of your other posts! It starts every Friday at 6pm, hope we see you there.